Baby number two was completely uncooperative during our 2o-week ultrasound, so it looks as if we will have a bit more of a wait until the gender can be determined. I’m leaning toward girl, because those legs were so tight together I don’t know how there could be anything between them! Due to the position of the baby, the tech was also unable to get a clear shot of the entire spine. This means that chances are very high that I will be getting another ultrasound in the not-too-distant future. Hopefully this kid will cooperate during the next one. For the record, T is fairly insistent that there is a boy in there, although she would prefer to have a sister. Looks like we’ll just have to wait and see! Well…Hooray for a baby!!! 😀 I’m excited that you’ll get another ultrasound, as I’m sure you are, but now I’m really DYING to know if T is right or not!! Hurry up doc and schedule another! awww, what a cute baby s/he is! Aww I’m bummed! LOL Can’t wait for the next one so we can know for sure! Ummmm!!! 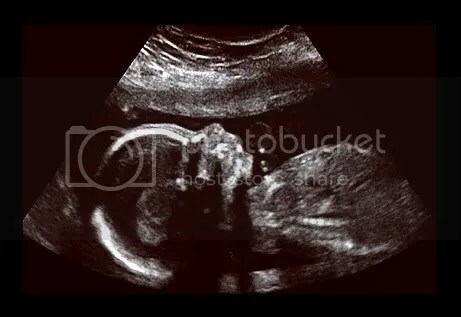 was waiting to know the gender…anyways glad to see little baby in there s/he is very cute!!!! Beautiful profile. I would say he/she looks just like you but… !! I had a few in my tummy that were uncooperative. But at least we got extra peeks at the precious little one. Happy Thanksgiving!! Soooo close! Geez! Why does your fetus have to be so dramatic? How exciting! Maybe next time…. 😉 Keep us posted–anxious to hear! We had a 3-D ultrasound with Andrew and it was a wonderful experience–I highly recommend it! What a cute, cute profile shot of your little one. How frustrating this baby is being so modest. Please get another ultrasound soon! Hm…can’t wait to find out yours (and mine). Let us know of course! I’m sad!!! I want to know NOW not SOON! But i do agree with you, it looks like T!